The first time I ate Picadillo was in 1972. I had some neighbors from Costa Rica who invited me over for dinner, and served a diced potato and minced steak picadillo, sort of like hash. I didn’t know much about cooking back in those days, so my memory of dinner isn’t crystal clear. It was over 40 years ago, after all. I was intrigued with their food and had a cooking lesson from the lady of the house on how to cook rice. She didn’t speak English, so she cooked and her husband, who did speak limited English, translated her instructions. I have a very fond memory of the three of us at the stove, with the translation going back and forth, as I asked questions, which were translated into Spanish. She was a marvelous cook, so she wanted to impart not just the how, but also the why. We did laugh quite a bit, as he was not a cook, and had to hunt for the proper words. This was my first foray into Latin American food, for which I shall always be profoundly grateful. 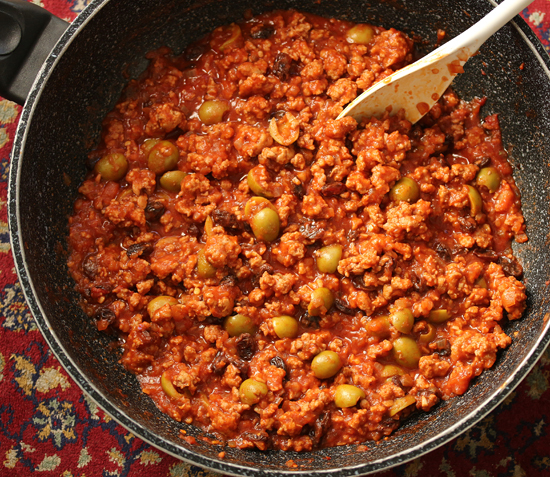 Picadillo is a traditional dish in Spain and many Latin American countries. It is made with ground meat, tomatoes and other ingredients that vary by region. It is often served with rice or used as a filling in dishes such as tacos, tortillas, tostadas, savory pastries or croquettes. The name comes from the Spanish word “picar,” which means “to mince” or “to chop”. 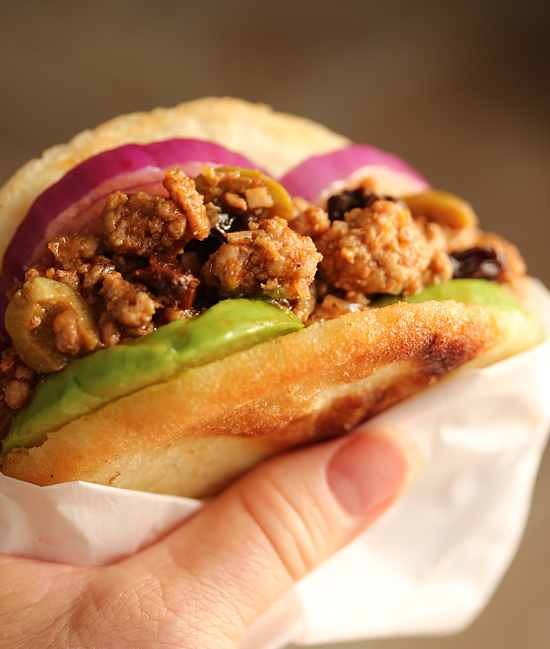 I used my picadillo to fill arepas, along with avocado and sliced red onion. Really tasty. 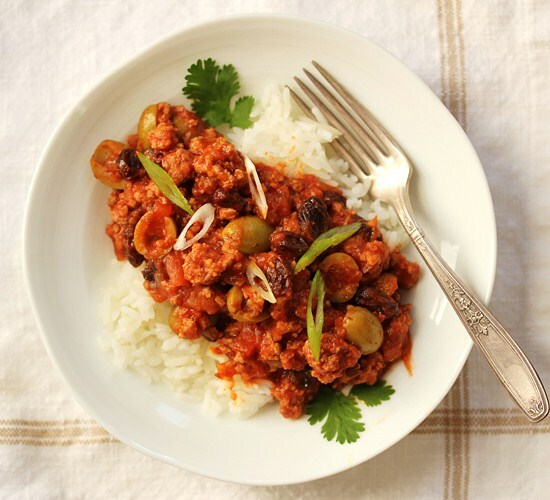 Depending on the country, picadillo may also include hot sauce, white vinegar, capers, diced green pepper, garlic, diced potato, diced chayote, white wine, annatto oil, diced ham, lime juice, guajillo chile sauce, chopped tomatillos, pinto beans, or chorizo. There is no hard and fast recipe, so you can be creative. Bon Appétit. 1. In a large heavy skillet, cook onion and garlic in oil over moderately low heat, stirring, until the onion is softened. 2. Add pork to pan and cook mixture over moderate heat, stirring and breaking up any lumps, until pork is no longer pink. 3. Add tomato sauce and paste, and stir to mix. Add raisins, olives, spices and herbs and simmer mixture, stirring occasionally, for 10 to 15 minutes, or until it is thickened. 4. Can be eaten over rice, to fill tortillas or tostadas, or to stuff arepas. Note: The picadillo may be made 1 day in advance, kept covered and chilled, and reheated before using. Note: May also include hot sauce, white vinegar, capers, diced green pepper, garlic, diced potato, diced chayote, white wine, annatto oil, diced ham, lime juice, guajillo chile sauce, chopped tomatillos, pinto beans, chorizo. I am not familiar with this dish, but that is about to change. I am traveling to South America next week, so I am going to search this out, knowing I can fall in love with it because I have a recipe. Thank you so much.